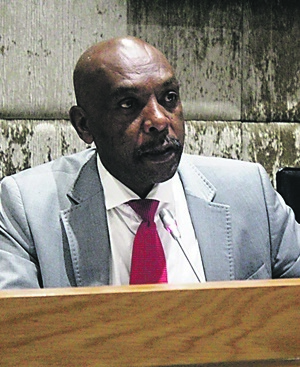 Long-serving ANC MP Vincent Smith was paid at least R670 000 by controversial facilities management group Bosasa over the past three years. In addition, Smith allegedly accepted the installation of electric fences and a high-end CCTV system at his home worth roughly R200 000, and allegedly also received R100 000 in cash from Bosasa chief executive officer Gavin Watson every month. Smith sits on Parliament's standing committee on public accounts. He is also the chair of the constitutional review committee on land expropriation and was this week elected to chair the portfolio committee on justice. Smith confirmed some of the payments, claiming that they were personal loans. However, he vehemently rejected the allegation that he received monthly cash payments, but confirmed that he knew Watson and his brothers, Cheeky and Valence. "We deny monthly payments by any of our directors, including Mr Gavin Watson, to Mr Smith," Bosasa said on Saturday. News24 has verified two payments to a company of which Smith is the sole director, Euro Blitz 48, totalling R671 000 in July 2015 and August 2016, one a cash deposit by a Bosasa employee and the other an EFT by an attorney from funds held in a trust account for Bosasa Operations. Documents show that, on July 14 2015, Bosasa finance employee Jacques van Zyl deposited R276 667 cash into the FNB business account of Euro Blitz 48 at the Krugersdorp branch of the bank. On August 5 2016, former Bosasa chief operating officer Angelo Agrizzi instructed Johannesburg Attorney Christo van Wyk via email to pay R395 076 into the same bank account from money held in trust for Bosasa Operations. Agrizzi, formerly a close confidante of Watson's, last week said he was ready to blow the whistle on the "racketeering, corruption and money laundering" at Bosasa, which he has been aware of for 18 years. He apparently told Van Wyk the funds were for a "car accident settlement". Van Zyl confirmed that he made the deposit and said he was instructed to do so by Agrizzi. He told News24 he could not recall the amount and did not know who it was for. Van Wyk also claimed he did not know the funds were for Smith, but confirmed the payment. He stated that if the transaction was, in fact, not above board, he would take the relevant steps to report the matter. Agrizzi, meanwhile, has stated that he was instructed by Watson to effect the payments. Bosasa, which is headquartered in Krugersdorp, changed its name to African Global Operations last year. Since 2003, the company has netted government contracts with Airports Company SA and the departments of correctional services, home affairs and social development worth R10 billion over the next five to 10 years. The company made headlines in 2009 after a Special Investigating Unit (SIU) probe found it had bribed former prisons boss Linda Mti and correctional services department chief financial officer Patrick Gillingham to gain billions in tenders from the department. The SIU report was handed over to the National Prosecuting Authority in 2009, but, to date, no action has been taken. Smith, who has historically been a vocal opponent of Bosasa in various parliamentary committees, particularly as a result of the SIU matter, on Saturday confirmed he received the funds, but denied knowledge that the money was paid by Bosasa. Smith rejected allegations that the money was a bribe, saying he had not given Bosasa any service or favour in return. He produced bank statements confirming the August 2016 deposit. Smith was adamant that he entered into a personal loan agreement with Agrizzi, and was led to believe Agrizzi was lending him the funds out of his own pocket. He required the funds to cover his daughter's university fees and approached Agrizzi, whom he referred to as his "brother", as he could not immediately afford the tuition. Smith's daughter attended Aberystwyth University in Wales and, according to evidence seen by News24, tuition amounted to more than R250 000 a year – excluding living and accommodation costs. Agrizzi dismissed Smith's assertion that it was a personal loan agreement as "ludicrous". "Why was it on Watson's instruction and from company funds? [Also] paid by a company official, where did Van Zyl get that amount of cash?" Agrizzi said. He denied he had given Van Zyl the cash to deposit into Smith's business account. "What I can say is that, albeit I was the operations officer of the [Bosasa] group, I carried out instructions according to a mandate of the board, or, more specifically, Gavin Watson, the chief executive officer and shareholder of the group, whom I reported to," Agrizzi said. Bosasa said: "We deny that any of our directors, including Mr Gavin Watson, ever instructed Mr Angelo Agrizzi, a former employee who has made equally outrageous claims against the company's directors in the recent past, to effect payments to Mr Smith through one of the trust accounts as alleged. On the face of it, this looks like a case of defrauding the company. Accordingly, we will be investigating this potential fraud against our company." Meanwhile, Smith maintains that the gentleman's agreement with Agrizzi dictates that he repay the loan in 2023, when an investment Smith holds matures and pays dividends. When confronted with details in a sworn affidavit by a former Bosasa employee stating he was instructed by Watson to install electric fencing and a CCTV system at Smith's home in Roodepoort, Smith once more mentioned Agrizzi, saying he had asked Agrizzi for assistance, who, in turn, had dispatched Bosasa employees to "upgrade" his system in 2015. The upgrades enabled Smith to remotely access his CCTV and alarm system, a necessary precaution, he stated, because he had been appointed to chair the ad-hoc parliamentary committee that dug into issues at the SABC. But no new cameras were installed, he claimed. Bosasa took a similar stance: "We are aware, from interaction with the said staff, that they were instructed by Angelo Agrizzi to go to Mr Smith's house to look at the security equipment at his house and provide advice on possible upgrades. For avoidance of doubt, our personnel only went to Mr Smith's residence to look at what was there and offer advice; they neither removed nor installed any equipment." But News24 has obtained evidence to the contrary. According to a source, when current Bosasa directors became aware in January that a group of whistle-blowers made up of former senior employees, including Agrizzi, were gearing up to blow the whistle on years of alleged corruption at Bosasa, a fleet of unmarked vehicles arrived at Smith's home to remove the CCTV system. News24 has obtained video footage from the same camera system showing individuals believed to be employees of Sondolo IT, a Bosasa subsidiary now named Global Technology Systems, removing the cameras. One of the cameras that was removed on January 10 had captured Smith while he strolled in his garden on December 22. Bosasa was supplied with screenshots of the video footage showing the faces of individuals who removed the cameras, but failed to confirm or deny the men were employees of Bosasa. Do you believe the money Smith received was in the form of loans from Agrizzi, or did the cash come directly from Bosasa?